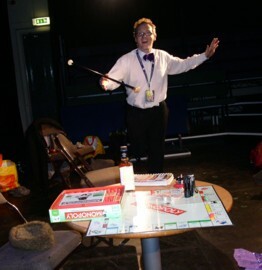 So dear blog reader, the almost mythical and legendary one-off performance of Monopolise! 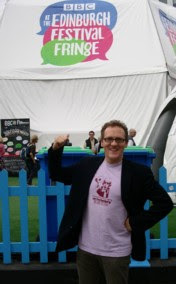 at the 2011 Edinburgh Comedy Festival passed off on Monday evening. Not without incident, admittedly. Whilst Mark pootled up to Scotchland under his own steam, Alfie and Keith's Thelma & Louise-style road-trip began at some bleeding obscure hour of the ... night, frankly. And included, en route a brief stopover on the hard shoulder near Dunbar so that Alf could report in to The Breakfast Show - hosted, in Alfie and Charlie's duel absence, by Simon Pryde. Check it out here at approximately two hours and twelve minutes into the show. After a light breakfast near Arthur's Seat (Arthur himself wasn't too bothered, apparently), the day continued with Alf's appearance on the great Fred MacAulay's MacAulay and Co on BBC Scotland at the BBC Village in central Edinburgh. Listen to ensuing - highly radio unfriendly - chaos here (about fifty one minutes into the show). Various other malarkey and shenanigans happened thereafter, including Keith proving that whilst he might be 'a singularly world famous (in Newcastle) TV reviewer,' his skills at 'walking in a straight line without doing anything stupid' leave much more to be desired when he managed to trip over his own feet on the Royal Mile and injured his wrist. Much to Alf's obvious amusement. 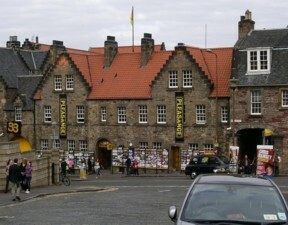 The venue for the 8:30 performance was upstairs at The Pleasance Courtyard. After the very lovely Justin Moorhouse had used an appearance on 5Live last week to give the show a plug and some quality leafleting from Mr Joey in the afternoon whilst Keith sat in the pub and whinged about his poor hand (and watched some cricket, admittedly), we had a more-than-decent-sized audience for the performance. 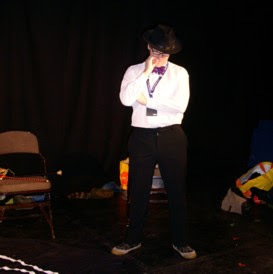 Unfortunately, being the middle one of three shows on the night in the venue meant that we didn't have as much time as usual beforehand to set up. And, thus, one or two props weren't where they should've been, necessarily, when they should've been there. It was all a bit discombobulating but, hey, what can you do? The show must go on. And, indeed, it did. 'Manic, but entertaining,' was the three-word review from those on stage. Though, yer actual Keith Telly Topping' climactic appearance as Chief Danno O'Hara was somewhat ruined when, in the words of his own four-word review the legend that is Mr Joey 'cut my mother******* line!' Ooo, he was cross, so he was. 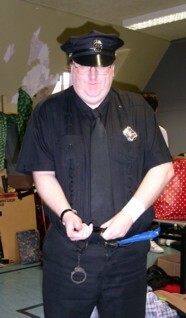 Some truncheon action could've followed. But it didn't. Words, however, were spoken on this matter, at length, on the car journey back to Tyneside. Anyway, we brought the show in on time - fifty eight minutes on the nail - Sheckie Le Geordie even having time to stop and have his picture taken. And, The Marxist Brothers found that Harpo had, once again, been silenced by The State. We had the laughs, we had the cheers, it was, indeed, time to get the heck from ... there. 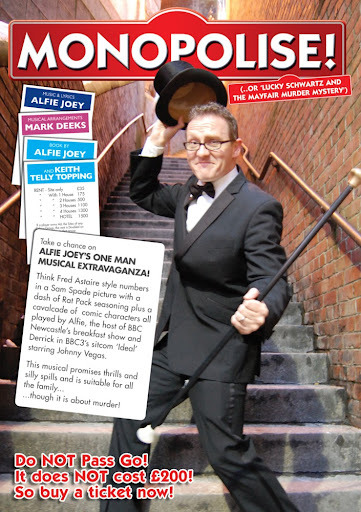 But not before we got the following, ringing, endorsement from the very lovely Jim Little on Facebook: 'Really enjoyed Alfie Joey in Monopolise! in the Pleasance CourtYard this evening. A cracking good show, well worth seeing. It was good to see Keith Topping reading the paper and keeping out of mischief!' Well, almost, Jim. Although I could tell you a few stories about wrist injuries and cut lines. Satnfatnrantbatnsatndockdasterdly. An hour in the bar, a dodgy kebab in Leith and then it was off home. We briefly paused in the Purdy Lodge Service Station (check it out, if you're passing, it's great) to have a look at Facebook and Twitter for messages of support, sympathy, or chastisement for that matter. Briefly, we considered lying to all of our friends that we were, at that very moment, in bed with a bottle of brandy, a nose full of blow and a couple of hookers. But, then we thought better of it and made in back to Newcastle, vaguely, in one piece. 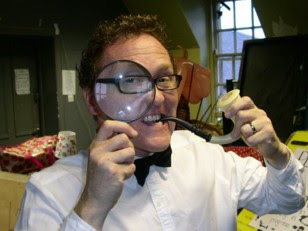 So, for those interested, the next performance will be at South Shields Customs House on Friday 2 September. 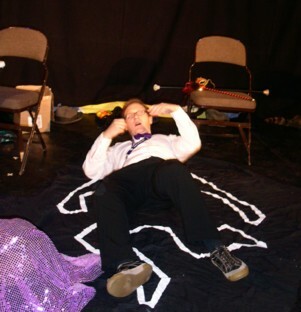 That will be the slightly longer two-act version which will include Keith's Leslie Whicker bit, the entire On The Town sequence, the 'Oh Mr Daniels' routine which we dropped at Newcastle and then put back in at Edinburgh cos it's 'the best bloody song in the show' .... and a few other tiny bits and piece which you might not have seen before if you caught either the Liverpool or Newcastle shows. And, hopefully this time, the Carmeena Veranda mask will be where it should be when Lucky does the big reveal at the end. And, also, Keith won't have his mother******* line cut again. I'm just sayin', I'm not bitter nor nothing. 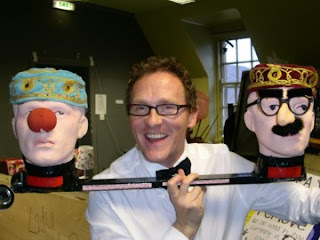 If we get any reviews from the Edinburgh show - other than, you know, 'the biggest load of tripe I have ever seen. That's an hour of my life I'll never get back' - then they'll be posted in due course. This mildly-self-deprecating description of real-time events was provided in written evidence by Officer Danno O'Hara Telly Topping (available for panto). Who had his mother******* line cut! And has slept about three hours in the last twenty four. I'm never doing that again! Sounds like a lot of fun and a great success in Edinburgh. Wish we could have been there to see it even if you did have you lines cut. Good luck with the show in South Shields. 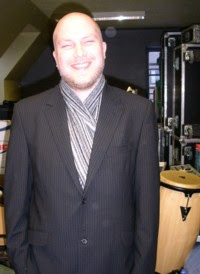 Alfie this blog is amazing - massive congrats on your performance.